Bohemia. Premysl Ottokar I, AD 1192 to 1230. Silver denier. Denomination : Silver denier. Mint : Prague. Date : Premysl had two reigns, AD 1192 to 1193 and 1198 to 1230. 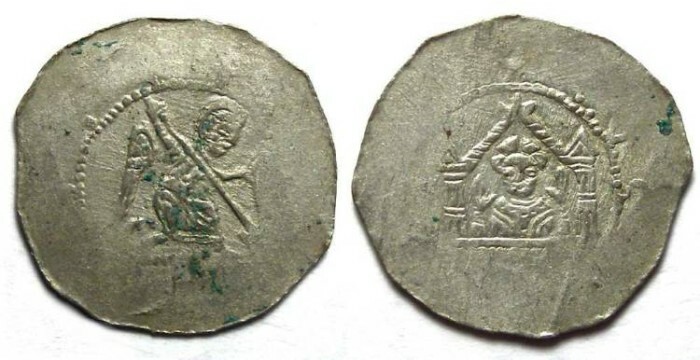 This type probably was struck during his second reign. Size : 18.5 x 20.1 mm. Weight : 1.19 grams. Grade : gXF with typical weak areas. Obverse : Saint Michael slaying the dragon. Reverse : Premysl in a castle, with his hands raised.